This is what happens when a writer, preacher, and lover of words encounters some of creation's wisest theologians...horses.First, she argues with them. They are, after all, horses. What could they possibly know about life and God that theologians haven't already written? But slowly she engages their language and listens to their holy wisdom, attending to how they express their being, their actions, and their relationships. She allows horses to draw her out of the faith of intellect and into a deeper faith of emotion, body, and soul.With edgy honesty and humor, Brock invites all who have longed for a deeper spiritual encounter with God to join her in the saddle (and occasionally on the ground) to discover how horses speak of God and how their ways of knowing help us to discover ways of God speaking to us. 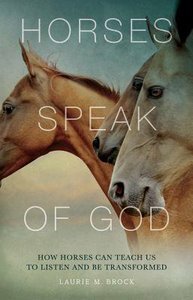 About "Horses Speak of God: How Horses Can Teach Us to Listen and Be Transformed"